If you are reading this article you are likely someone very involved in sports or you have a physically demanding job. You may be a baseball pitcher or the parent of a baseball player, likely a pitcher, doing your research looking for that non-surgical alternative that will save next season for your son. You may be doing research for your daughter to keep her on the softball diamond. You may be a landscaper, tradesman or construction worker who does a lot of overhead work looking for the same thing, saving a season of work by getting your shoulder non-surgically repaired. Your went to the doctor with concerns of pain, possibly a clicking sound and a sense of shoulder instability and loss of strength. In sports, like tennis, baseball and softball, your serve and your pitch (or throw from the outfield) may have lost a lot of steam, there is painful motion. Your shoulder may be catching or gets stuck. You may be a frustrated parent looking for something that will work and get your player back on the field. At the work site you have difficult with things that require overhead movement. Whatever the reason, you have a shoulder problem. It is a tear in the Glenoid Labrum, the fibrocartilagenous structure that forms a deep pocket that helps keep the humerus bone in the shoulder socket and provides pain-free range of motion. SLAP stands for superior labrum anterior and posterior, meaning there’s a tear from front to back on the top of the glenoid labrum. Later in this article we will discuss how to repair a SLAP lesion without surgery. As we will see in the research in this article, doctors are exploring ways to make conservative, non-surgical options a better choice for patients. Why? Because surgeons are publishing study results suggesting that the surgical option is not the “cure-all to end-all,” when it comes to a SLAP tear. There is some disheartening research about the reality of surgery. Understanding your realistic options may help you make a realistic plan for recovery. Research: In non-surgical conservative care a realistic option? Nonsurgical treatments are usually the first-line therapy for symptomatic SLAP lesion. However, some patients cannot obtain satisfactory improvement of their symptoms, leading to dysfunction of the shoulder and diminished pitching performance. The patients they did not include in the study were tramuatic injury people, such as thoe who suffered a dislocation, fracture or injuries related to sports activities. Playing positions included pitcher (21 patients), catcher (3 patients), infielder (13 patients) and outfielder (8 patients). Of interest to note is that these players had shoulder problems for an average of 8 and a half months before nonsurgical treatments included physical therapy, such as range of motion, stretching, and rotator cuff exercises, as well as prescription of nonsteroidal anti-inflammatory drugs if necessary were given. The older the player, the less likely non-surgical treatments would work. The longer you played baseball, the longer the length of your playing years, the less likely non-surgical treatments would work. What position you played, pitchers would likely be less successful at non-surgical treatment. The longer you had the shoulder pain, the less likely non-surgical treatments would work. If you did not have full or at least a good partial range of motion in your shoulder, the less likely non-surgical treatments would work. Presence of Bone or Bennett spurs the less likely non-surgical treatments would work. Partial-thickness tears of the articular-side rotator cuff the less likely non-surgical treatments would work. The only non-surgical treatment the doctors found that worked was when shoulder muscular tightness was involved in the early stages of the tear and treatment focused on rest and rehabilitation. Is this then why your SLAP tear conservative treatment failed? Because the treatments in general, beyond rest and shutdown, do not repair anything. So if you went to a doctor with a problem in your shoulder. You went then for an MRI. Physical therapy and exercise tried. Pain and inflammation pills tried. You went back for an MRI, if the MRI is just as bad- you get recommended to SURGERY. IT IS IMPORTANT TO NOTE: There are many non-surgical less invasive procedures. This study examined physical therapy, exercise, and anti-inflammatopry medications only. It did not examine regenerative medicine which we will below. Category 1: Non-operative management that includes scapular exercise to restore muscle balance in the shoulder wings. Shoulder exercises according to these researchers would be expected to provide symptom relief in 2/3 of all patients; enough to prolong or delay surgery. Category 2: Patients with a clear traumatic episode (larger tears) and symptoms of instability (possible chronic dislocations and subluxations) should undergo SLAP surgery and be divided into two surgical groups by age. with (if over age 40) biceps tenotomy or tenodesis; (repair or cutting away of part of the bicep tendon). Biceps tenotomy is the cutting of the tendon to release its hold on the muscle and reduce spasms and stiffness. The muscle spasms and tightness is an attempt to stabilize the shoulder and prevent further injury. If you can repair the SLAP lesion, then biceps tenotomy is thought to speed recovery by removing the stimulus to spasm. Biceps tenodesis is usually reserved for patients over 40 because of its more radical nature. The Biceps tenodesis cuts the tendon to remove it from the labrum and then reattaches it directly to the bone. The diagnosis and management of SLAP lesions remain controversial. A detailed history and physical examination are more valuable than imaging. Non-operative management focused on scapular rebalancing is often effective. Surgery should include repair of the SLAP lesion if the history and physical examination are consistent with instability. Surgery, if performed, should be as minimal as possible to improve their chances of both return to sport and preinjury activity level. As you can see there are reasons surgery should be strongly reviewed is that the surgery may not help, may make your shoulder situation worse. of 2,524 patients who had a SLAP lesion surgical repair, after 3 to 11 years of follow-up, 10% of patients (254 of 2,524) underwent repeat surgical intervention on the same shoulder as the initial SLAP repair. debridement, a “power washing” of the debris and damaged tissue in the shoulder (26.7%). and biceps tenodesis or tenotomy (13.0%). This is a more radical procedure usually reserved for aging patients and involves cutting the tendon attachment of the bicep to the shoulder labrum and attaching it to the humerus bone (upper arm). In a combined study from University of Minnesota and German researchers, doctors found that if conservative treatment fails, successful arthroscopic repair of symptomatic SLAP lesions could be achieved. However what was the measurement of success? If it was return to sport, or function in older patients, it was not that successful. the results of arthroscopic repair in throwing athletes are less successful with a significant amount of patients who will not regain their pre-injury level of performance. The clinical results of SLAP repairs in middle-aged and older patients are mixed, with worse results and higher revision rates as compared to younger patients. These doctors also looked at the problem of “normal variations and degenerative changes” in the SLAP complex that needs to be distinguished from “true”SLAP lesions in order to improve results and avoid overtreatment.” Possibly avoid a surgery based on the wrong recommendation. In a recent review of SLAP lesion repair surgeries, one author, Stephen C. Weber, MD, noted the rise in both the number of repair surgeries and complications associated with them. This study looked at the American Board of Orthopedic Surgery database for SLAP lesion repairs. With 4,975 repairs in the database, only 26.3% of the patients reported a complete resolution of pain. Worse, only 13.1% of them reported normal function. The author expressed concern over the number of young orthopedic surgeons performing SLAP lesion repairs and also the number of middle-aged and elderly patients receiving them given the complications associated. Four years later researchers suggest the best diagnostic tool is still surgery and doing some repair while you are in there. The above recent study published in the American Journal of Sports Medicine analyzed the post-surgical outcomes of athletes with SLAP lesions (superior labrum anterior to posterior tears). One hundred seventy-nine military athletes were used in the study, all of which underwent surgery to fix an existing SLAP lesion. Out of all the operations, 36.8% of these surgeries were considered a “failure” and 28% had to be redone. That means that 66 individuals had a failed surgery and 51 had to go back into the operating room. At two to five year follow-ups, a significant amount of these athletes still had decreased range of motion in the affected shoulder. Researchers concluded that an age greater than 36 years old was the factor that was associated with an increased chance of surgery failure. Other studies have shown similar statistics with many participants unable to ever return to their previous pre-surgery activity level. The major long-term functional problem of surgical treatment for shoulder labrum tears is that the surgery usually confined itself to stapling or suturing the labrum itself and did not address damage occurring in the whole shoulder. Treating the Glenoid Labrum or SLAP tear with sutures and staples would indicate the pain is coming from an isolated tissue damage. It is thought by keeping the humeral head in the socket, chronic instability will go away. In reality, this is not the case. Any type of injury affects all the structures of the joint. In the patients we see at Caring Medical, this is not the case. 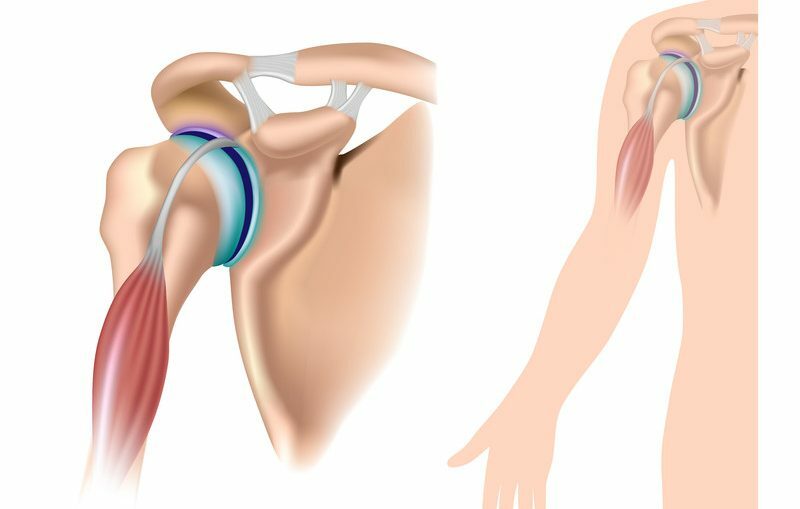 People with shoulder labrum problems have whole shoulder joint instability, they have damage to the shoulder ligaments front and back, they have damage to the rotator cuff tendons and damage to the biceps tendon that surgery cannot address. The published return-to-play (RTP) rates for athletes who have undergone surgical repair of superior labrum anterior-posterior (SLAP) tears vary widely and are generally accepted to be lower in the group of competitive throwers (baseball pitchers). Therefore the effectiveness of nonsurgical treatment should be explored. The Houston group looked at 119 patients in a single professional baseball organization with persistent shoulder pain that limited the ability to compete. Sixty-eight patients had magnetic resonance imaging-documented SLAP lesions. All patients had failed 1 attempt at rehabilitation but had continued with supervised physical therapy. Treatment was according to an algorithm focusing on the correction of scapular dyskinesia and posterior capsular contracture with glenohumeral internal rotation deficit (GIRD), followed by pain-free return to throwing. Scapular dyskinesis or SICK scapula syndrome is considered an overuse injury (common in throwing athletes) in which there is abnormal movement and resting location of the scapula. Posterior capsular contracture with glenohumeral internal rotation deficit (GIRD) also dignify abnormal movement of the shoulder with overuse being a possible cause. Those who failed 2 cycles of nonsurgical treatment were treated surgically. (2) a more stringent standard of return to the same level/quality of professional competition (level A baseball, Double A baseball, Triple A baseball etc.) with the incorporation of a return to preinjury individual performance statistics (earned run average, walks plus hits per inning pitched), termed “return to prior performance” (RPP). Sixty-eight athletes were identified with SLAP lesions. Twenty-one pitchers successfully completed the nonsurgical algorithm and attempted a return. and their return to prior performance rate was 22%. The return-to-play rate for 27 pitchers who underwent 30 surgical procedures was 48%, and the RPP rate was 7%. For 10 position players treated nonsurgically, the return-to-play rate rate was 39%, and the RPP rate was 26%. The return-to-play rate for 13 position players who underwent 15 procedures was 85%, with an RPP rate of 54%. Nonsurgical treatment correcting scapular dyskinesia and GIRD had a reasonable success rate in professional baseball players with painful shoulders and documented SLAP lesions. The rate of return after surgical treatment of SLAP lesions was low for pitchers. The return-to-play rate and RPP rates were higher for position players than for pitchers. 62.5% were able to return-to-play at the Major League level after SLAP repair surgery. Of those able to return-to-play, 86.7% were able to return to prior performance. People with SLAP tears who call or email us, do so because they want to avoid surgery. Perhaps it is the athlete who cannot afford to miss a High School or Collegiate season or it is a house painter or the tree trimmer or the carpenter who cannot afford extended time away from his/her business. H3 Prolotherapy. This is a simple dextrose injection that promotes tissue healing through a controlled inflammation. Platelet Rich Plasma Injections which is the use of your own healing blood platelets to repair damaged tissue. For significant damage or when healing needs to be performed on a more accelerated method, we may prescribe stem cell therapy. This is the use of your own stem cells. We do not offer stem cells to every patient. We find that H3 Prolotherapy and PRP injections provide the patient’s goal of treatment within the time frame they are looking for. This procedure is explained in the video below. As explained in the video above and presented in more detail here. A patient may get 30 separate injections in one Prolotherapy treatment. Why so many treatments? Because we are treating the entire shoulder joint complex. This includes the shoulder ligaments and tendons as well as the SLAP lesion. This of course would be especially beneficial to laborers and athletes because you are strengthening the other important areas of the shoulder. We typically recommend exercises that limit their shoulder motion so the elbow stays close to the side. We would discuss altering work related movements to keep the elbow close, like how to swing a hammer or use power tools. For the athlete how to throw. It is important to keep pressure of the labrum while it is healing and rehab properly. We will often see patients who went to their orthopedic surgeon and were able to receive a PRP injection into the shoulder. In our experience, we have found that you cannot simply offer a single platelet-rich plasma injection inside the joint and expect superior results. When Prolotherapy/PRP injections are offered here, as just mentioned, a patient may expect 30 injections and a comprehensive treatment. Regenerative injection therapies, including prolotherapy, have shown promise in the treatment of several musculoskeletal disorders, but have not previously been applied to glenoid labral tear. Here we review several important aspects of these lesions and present an initial case series of 33 patients with labral tear that were treated in our clinic with intra-articular injections of hypertonic dextrose. Patient-reported assessments were collected by questionnaire at a mean follow-up time of 16 months. Treated patients reported highly significant improvements with respect to pain, stiffness, range of motion, crunching, exercise and need for medication. All 31 patients who reported pain at baseline experienced pain relief, and all 31 who reported exercise impairment at baseline reported improved exercise capability. Patients reported complete relief of 69% of recorded symptoms. One patient reported worsening of some symptoms. Prolotherapy for glenoid labral tear appears to be a safe procedure that merits further investigation. If you have questions and would like to discuss your shoulder pain issues with our staff you get get help and information from our Caring Medical staff.